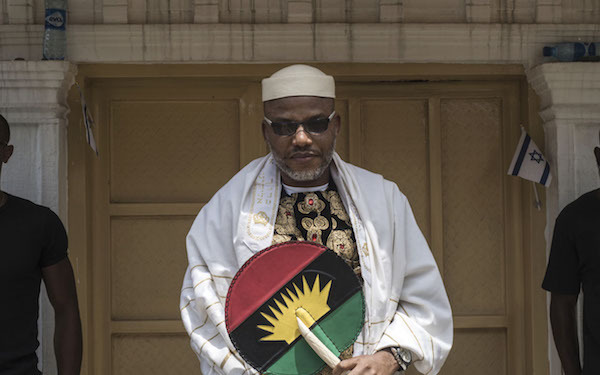 The Federal Government has asked the court to revoke the bail granted leader of the Indigenous People of Biafra (IPOB), Nnamdi Kanu. Kanu, who was released on bail at the end of April after being detained for nearly two years, still faces trial on treason charges. Send the joker behind bars and let's move forward in Nigeria. What has he done for his people ever the years ? Buhari has deep hatred for the Igbos. A man of Bahari's nature does not deserve to be President. Ask Buhari and his Northern parasites to restructure Nigeria. Restructure is a word Buhari and his Northern parasites do not want to here. Yes,that joker has pushed his luck way too far.Send his a** back to jail. He is just using the fools called themselves Biafools to make money into his own pocket. Some verses in the Hausa/Fulani holy book – Koran states that all non-Muslims (infidels /unbelievers) should be killed. Is that not hate speech by their holy book? Who is going to prosecuted all Hausa/Fulani including Buhari, a believer of the hate speech in the Koran? Who is going to prosecute the Emirs, the Sultans that are believer of the hate speech in the Koran? Fucked up fake country – Nigeria.